The participant tools were tested with default settings on live databases on SQL Server 2008 that installed with default settings on a desktop (with a dual-core processor and 2Gb of RAM). Both competitors tools and SQL tools by Devart were installed on the same desktop. Two databases with total size of 1Gb: 115 tables containing one with 3 million records of numeric and string data types, the other with middle size BLOB data. Task №1: We measured the speed of each tool while comparing the data, generating an update script, and at last synchronizing the databases. 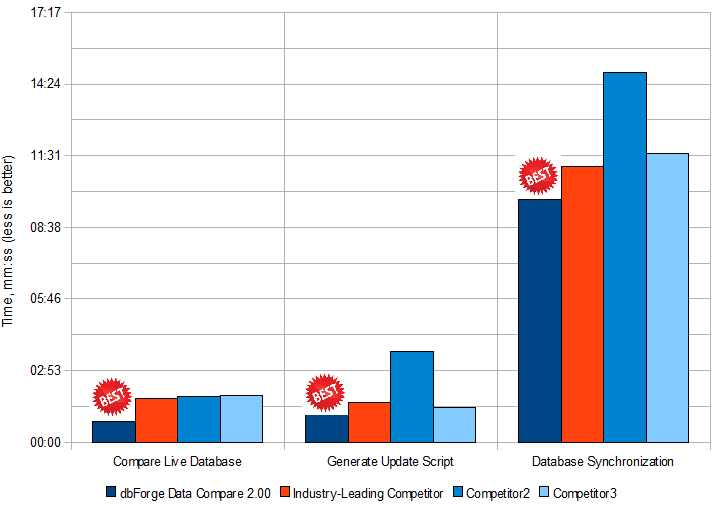 Result №1: Tests results show that dbForge Data Compare for SQL Server v2.00 has leaved the competitors far behind. 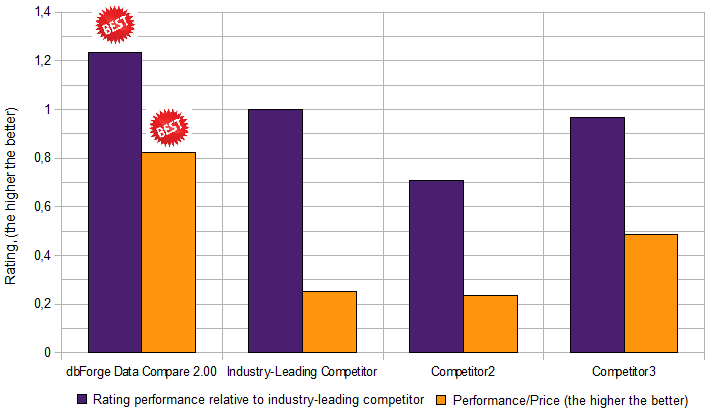 Task №2: We decided to compare the performance of the selected participant tools based on the main industry-leading competitor’ performance. Besides we took into account the product price and tried to calculate the efficiency as best performance for less money. Result №2: This graph shows that not all the tools can be proud of delivering an expected combination of best performance and best price. dbForge Data Compare handles this task well. To fully complete our research, we decided to go the whole hog and use the aforementioned tools to compare large databases with the size of 120Gb (some tables in these databases have 2.4 billion records, some tables contain 1.5Gb of LOB data, the FILESTREAM table is with 5.3Gb of records). dbForge Data Compare was good at comparison, while neither of the competitive tools compared tables with LOB data and records in the FILESTREAM table. When we excluded such tables, only one tool coped with 2.4 billion records. Speed rate of dbForge Data Compare is several times higher than other popular competitive tools have. Try dbForge Data Compare on your SQL Server database. Delivering qualitative data comparison and synchronization is our fame. We guarantee quick support and product improvement if dbForge Data Compare fails to compare and synchronize your database. We even may give you the product license for free. Moreover, you can take full advantage of data comparison and synchronization functionality in dbForge Compare Bundle that includes both dbForge Data Compare for SQL Server and dbForge Schema Compare for SQL Server, and also allows you to save money as compared to buying the tools separately. We compared some best-of-breed comparison tools with dbForge Data Compare 2.00 to find out which one is speedier to compare and synchronize data in SQL Server databases. The participant tools were tested with default settings on live databases on SQL Server 2008 that installed with default settings on a desktop with a dual-core processor and 2Gb of RAM. Both the SQL Server and the tools were installed on the same desktop.